In 1909, Shotaro (Tom) Shimizu arrived in Prince Rupert, in northern British Columbia, having worked for two years on the railways in the United States after leaving his home in Nara, Japan. As the second son in his family, he felt he had to go abroad to seek his fortune. Upon hearing that he could become a citizen of Canada, he left the US for Prince Rupert, the planned western terminus of the Grand Trunk Pacific Railway. When the city’s founder and well-known railway executive Charles Melville Hays died in the sinking of the Titanic, the grand plans for Prince Rupert as a gateway to Asia died with him. Shotaro decided to remain in Prince Rupert, and in 1915 returned to Japan to marry, bringing his bride back to Canada with him. In 1917, Shotaro, in partnership with George Nishikaze, a former houseboy from Victoria, opened a 30-room hotel and restaurant called the Dominion Restaurant and Hotel (it became the New Dominion in the 1930s when it was repainted) on Prince Rupert’s Third Avenue. Shotaro’s first wife died in Japan during the Spanish Flu Epidemic of 1918, (his son Shoji [Andy] survived and stayed in Japan until coming to Prince Rupert in 1936) and Shotaro remarried in 1926, four years after becoming a naturalized Canadian. During the 1930s, despite the Depression, the business did well. Shotaro and his wife Kimiko, along with their four children and Andy, lived in the hotel, where they all pitched in running the business. In 1939, the Second World War broke out in Europe, bringing shipbuilding contracts, and an influx of workers, to Prince Rupert. Business was very good. Then, on December 7, 1941, everything changed in a heartbeat. Following Japan’s attack on Pearl Harbor, Canada and the US declared war on Japan. All Canadians of Japanese descent were ordered to register with the government, and all property, fishing boats, businesses and other belongings were seized. The family stayed in Hastings Park for six months before relocating to New Denver, where they reunited with Shotaro, who had gone on ahead to help build housing for the 1,500 internees who would be housed there for the duration of the war. When the war ended, the Shimizus, like all the other internees, where given two choices: relocate east of the Rockies or be “repatriated” to Japan. The New Dominion Hotel had been sold by the Custodian of Enemy Property, so there was nothing to return to anyway. Leaving New Denver in 1946, Shotaro moved his family to Edmonton to start their lives over. A hard worker, he prospered in his new home, but he retained a soft spot in his heart for Prince Rupert, where he had become a Canadian and got his start. Flash forward 59 years to March, 2018. Gregory Shimizu, Henry’s son and Shotaro’s grandson, is a taiko player in Edmonton, where his grandparents set down their roots. Greg first experienced taiko as a child in 1975, when Ondekoza, Japan’s first taiko supergroup, performed in Edmonton. Then, in the 1986, his father Henry arranged to have Northwest Namukai from Washington state perform at the Japan Pavillion at Edmonton’s Heritage Festival and hosted the group members at his family home. Greg was hooked. Before long, Kita no Taiko, Edmonton’s first taiko group, was up and running. Greg played with the group for twenty-plus years before leaving in 2008 to form Booming Tree Taiko, Alberta’s first professional taiko group, with Twilla Macleod. Together, they have performed and taught extensively across North America. Although he doesn’t talk about it much, the name of the group, Booming Tree, is a nod to his grandfather, Shotaro Shimizu, and his amazing donation of 1,500 sakura to the city of Prince Rupert. 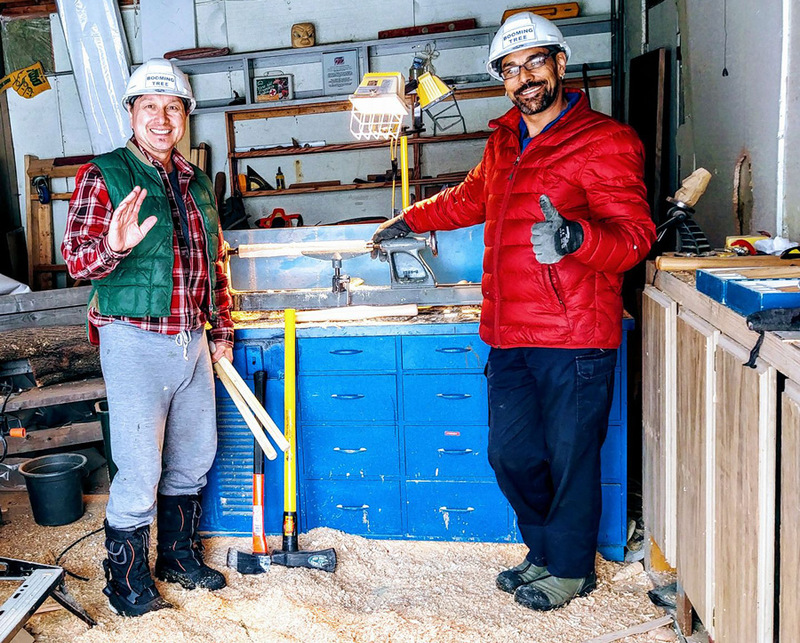 This March, when Greg got word that a number of his grandfather’s cherry trees had been cut down by a work crew in Prince Rupert, he felt it deeply. The date? March 23, 2018 – seventy-six years to the day that the family was shipped out of Prince Rupert aboard a train, beginning their long years of exile. Beyond his own feelings about the news, what impressed him was the depth of feeling that the loss of the trees elicited in the local residents. Shotaro Shimizu passed away in 1981, far from the city he made his first home in Canada, and the trees he gave to make it more beautiful. How were you first alerted to the fact that some of your grandfather’s gift trees had been cut down? I missed a phone call on Friday March 23. I saw that it was the Prince Rupert Archives and I immediately knew the call must be about cherry trees. I took to the internet and found the news. I navigated to the Prince Rupert Mayors page to discover a massive amount of comments from upset citizens. It was there I first shared the history of the trees. Have you found any more information on how the decision was made to cut down the trees? 1. The decision to cut down the trees came from Public Services and Procurement Canada (PSPC – formerly known as Public Works Canada). This department is in charge of things such as landscaping federal property, etc. 3. After talking to PSPC, they mentioned to me that the contract simply mentioned ‘general landscaping’ as part of their new policy to ‘modernize’ federal properties, but the contract did not specify any removal of trees. If removal of trees had been part of the language in the contract, they believe they would have treated this situation differently. The trees were not in poor condition and I told them that this is absolutely unacceptable, particularly due to the historic significant of those trees. It is quite evident to me that they feel absolutely terrible about this situation, and that they never would have caused this much heartache if they had known about their significance (hence checking in with the community before-hand). Thus, they have confirmed they want to make amends and make this situation right for the community in the near future. Did you know your grandfather well? In general terms no. He passed when I was in high school. Growing up, there was a double wall that was difficult to overcome: firstly he spoke mainly Japanese, with not much English to me, and secondly was his blindness. Somehow as a child I did not feel ‘seen,’ so it was much harder for me to connect. My memories are of a happy old man. He would roll his own cigarettes, but as I recall it was just to have one a day. He would listen to the radio and go for walks. They had a very old house that overlooked the river valley. I really remember his white cane as a child I remember gatherings and a lot of Japanese being spoken. We saw him during holidays and other big family gatherings. Your grandfather clearly felt a strong affection for Prince Rupert, yet he was run out of there simply because of his race. Is there a lesson there, do you think? We know that he really looked to Prince Rupert as having such potential economically. It seemed he set in his heart that that was the place that he was going to make his mark, which he did with the business. I think it speaks to how strong a connection one has for ‘home’ – either going back to one or finding a new one. It seems he had found his home and lived a long part of his life there. Perhaps the phase of him going blind played a part in such a large and important gift. Almost like he was losing part of his history, so he was adding to it or memorializing it. There seem to be many potential reasons to choose a donation of cherry trees as they are such a strong symbol of Japanese culture. Being blind may or may not have been part of the equation. Such an overwhelming number of them would certainly leave their mark on the landscape of the town. It was noted that in the 1940s, several town organizations were in favour of removing the Japanese; it could have been his way of inserting a sense of all the Japanese that were removed, most of whom did not return. So that their spirits were there by way of the trees. Shotaro made the donation of the 1,500 sakura after he went blind, he was never going to see the trees bloom. That’s amazing to me. Did he talk much about his years living there? No, it was never discussed in front of me or brought up. Life moved on. I’ve known your father on and off for many years, and he’s quite the man. In fact he’s urged me more than once over the years to interview you. I’m glad I finally have the chance! How were you brought up – what values do you feel he instilled in you? I think mostly the sense of getting involved in things, working hard, contributing. Both my father and mother continually engaged themselves in work, and the community. My Mom was on many boards and organizations (art gallery, opera, United Way and many more), my father was mostly working, and if not there he was involved in different organizations like the EJCA and Redress. I think what I learned was not what I was told by them but what I saw them do. They were driven and took action, spending time and energy doing positive things. What was it like growing up in Edmonton at the time? I never thought of myself as a minority or ever felt I had to overcome anything. We were Canadians living a Canadian life. I think being mixed, it was more like being double rather than hafu. Certainly, having the Shimizu last name over the years just meant having a lot to live up to. It meant just trying to do the best I can do in what ever job or activity I was involved in. I think there was also the concept of being Japanese and that also had some level of politeness, correctness and hard work attached to it. You’re a triathlete (and a vegan one at that! ), something you started relatively late in life. Then in 2012 you had a bad accident while training on your bike. What was it like recovering from that? It must have affected your work as a taiko player. Are you fully recovered? I took up triathlon (swim, bike, run) in my 30’s, after getting deep into the sport I discovered the path to the World Championships. I have raced 6 Age Group Triathlon World Championships 2003 – 2014. I qualified now for my 7th Worlds 2018 in Australia and the Brain Care Centre is sponsoring me. In 2012, Booming Tree was busy with shows and I had just recently opened my own restaurant, I was in peak physical condition, looking to qualify for Worlds 2013. Then it happened. I told Twilla I would be back in a few hours, it was sometime just after 8pm, June 18, 2012. I went training on my Tri bike, about 8 blocks from home, I was going down a hill and a van coming up decided to make a u-turn crossing my path. I went head first into the side of the van. I remember nothing, even pre-accident. Later at the hospital I became more aware of my surroundings and ‘awoke’ to a new surreal reality. The guy that walked out that day in 2012 to go training, well, he hasn’t returned yet. I often say my experience was like ‘my spirit left my body, but my body did not know it was dead yet’. My injuries were far from life-threatening, but the life changing impact has been immeasurable. I suffered a very bad head injury, the result being severe post concussion syndrome. Recovery is a slow process, but I still notice changes for the better as the years go by. I may never be the old me again, but I’m okay with where I am now. In regards to taiko: I often say a severe concussion is an injury that from day one starts to try to take everything from you. Because it can affect people in very physical, emotional and cognitive ways it can easily and slowly erode one’s life. After the accident I saw this starting to happen. Like going down in a boat, what are you going to grab before it sinks? The one thing I always told Twilla is that I was not going to let this injury take away my taiko. It was the thing that brought us together. It was more meaningful to me than my business, or house. I knew playing and performing was also going to be good for my mind, body and spirit. It would be something that would give me meaning, it would mean my future, my very life. Once I recovered from some of the bodily damage we continued to perform professionally, but it was unknown to most as to how severely injured I was. One show could take a week to recover physically, emotionally and cognitively from. Because of my memory problems, we have adjusted some songs so that they have a more improvised structure for me. I play both back beat and melody but never the same way twice. Coming up six years now I am finding a manageable balance, but I still have a life constrained by limitations and consequences. I use the taiko to try to connect me to my past, to try to connect me to myself and to others. I use taiko to try to connect with life. 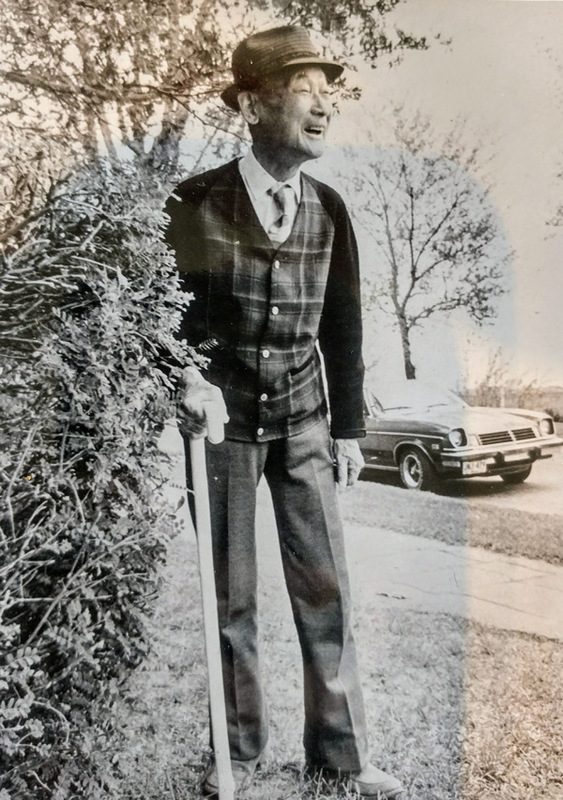 I have become connected to my Grandfather who went through his own traumatic experience at the same age I did, losing his business and then, in his case, living the rest of his days without sight. Making bachi from the wood of the felled sakura is a way of extending the life and the reach of my grandfather’s gesture of goodwill and hope. 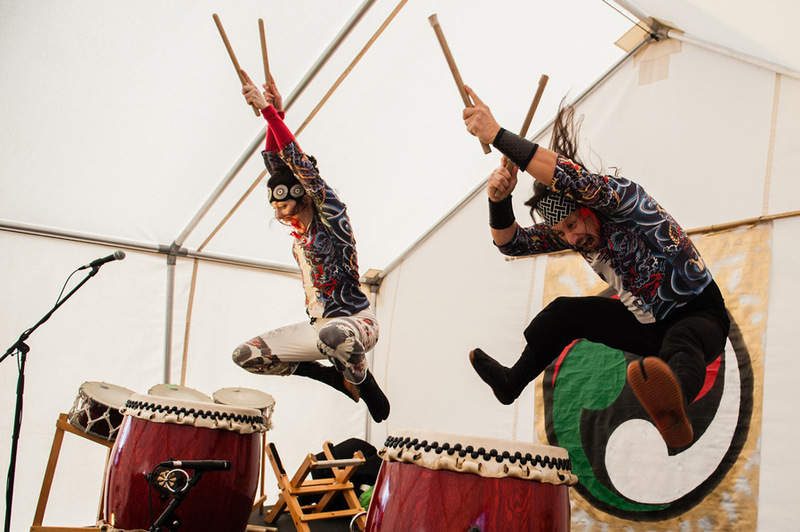 Having others connect with the story is a way of acknowledging the past, seeing the power of forgiveness and bringing to light the joy and sense of home being in a taiko group can bring. Your sister also plays taiko. Talk a little about her and what she does. Did you ever play together? Yoshiko spent about eight years with Yakudo in Toronto and another nine with Midnight taiko in Calgary. So unfortunately, she has always been a little to far way to play taiko with. other than just a couple of times over the many years. She just recently moved back to Toronto and is getting involved there with the re-emergence of Yakudo, which had gone dormant. She will be organizing things in Eastern Canada for the bachi project and has secured access to a lathe in Toronto. She is excited to be part of this connection through the family and taiko. I think your plans for the bachi are really beautiful – what a wonderful way to share your grandfather’s legacy and his gift. How is the project progressing? The bachi project is still ongoing, as my contact in Prince Rupert is still sorting out what is to happen next. As a volunteer project, it is in the hands now of a few people making things happen, so I am right now waiting on action from them. On my end, I have lined up a person who is going to donate all his time and lathe for the project, and he has already made some sample bachi with test wood. My sister Yoshiko in Toronto has also secured access to a lathe, should some be produced out there. On the other extreme I am still getting requests. We have now got groups from almost every province in Canada and many places in the US (Florida, Hawaii, New Jersey, Pennsylvania, Washington, California, Oregon). We also have people from groups in England, Wales, Ireland, Brazil, Spain, and Taiwan. As the story continues, so do the messages continue to come in. Our goal is to do as much as we can on volunteer work. Shipping bachi out will be the largest and single cost. I do get regular message from people wanting to donate financially but for now I have turned them all down, but at some point I will have to create a budget for the shipping component. We may also look into all the different sources of sponsorship for this shipping piece, be it arts grants, organizations or individuals. Due to the finite quality of actual bachi to be made I am already looking at perhaps pairs of bachi to go on a ‘life long’ journey from group to group. The idea for sakura bachi is that they are to be gifted to taiko groups in the spirit of the original donation. When people and groups now play with them they will give new life to the sakura. We are also writing a song, The Sound of the Sakura, in honour of the donation.